Our spacious and elegant hotel, Royal Crown Hotel is conveniently situated just across the Siem Reap river from the bustling French quarter and the Old Market. The building has retained the true colonial French characteristics. The luxury accommodation are all tastefully furnished, spacious, decorated in soft, subtle colours and impeccable clean. 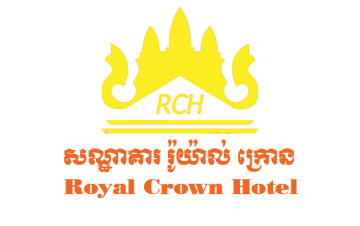 The Royal Crown Hotel to make your visit to our country a unique and enjoyable experience. The hotel is just 10 minutes drive from Siem Reap international airport and while it's only 15 minutes to reach the world heritage temple of Angkor. A beautifully warm and harmonious lobby gives you the first impressions of the quality and space of the hotel. A very friendly and experienced staff will welcome you with their fine Khmer friendship and hospitality and help you to appreciate the beauties of their country.